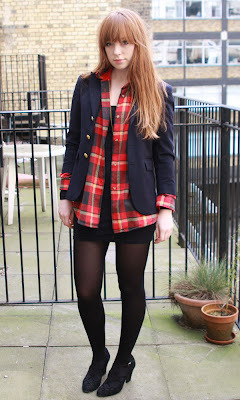 SHOW ME YOUR WARDROBE.COM: Eleanor Cording-Booth; Online Assistant of Start-London.com. Eleanor Cording-Booth; Online Assistant of Start-London.com. Uh-oh... now I've found this blog I think I have a new daily web check. LOVE it. I haven't added a new link to my blogroll, but this one def. takes the cake. Wonderful. Love the last outfit, the check shirt and blazer are the perfect match.